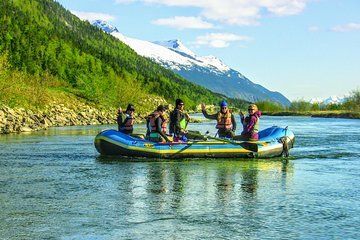 While your ship is docked in Skagway, enjoy a 40 minute raft ride on the Taiya River. During this peaceful river float, a knowledgeable guide points out any wildlife, including possible bald eagles and even bears, depending on the time of year. Learn about Skagway’s history as you snap photos of spectacular mountain scenery. This family-friendly shore excursion comes with port transport. After port pickup from Skagway, take in stunning scenery during a 10-mile (16-km) drive along the coast to the Dyea Valley, an old Gold Rush settlement rich with history. Keep your eyes peeled for seals, eagles and other wildlife, and spot the beginning point of the famous Chilkoot Trail, where thousands traveled in search of gold in 1898. After the float, settle on a riverbank for a snack break while admiring the beauty of your river and mountain surroundings. You’ll be transported back to the Skagway cruise ship terminal. If time permits, your driver will make a stop at an overlook that gives you 360-degree views of Skagway and cruise ships in port. This was our first time using Viator but it won’t be our last. Island Joe, our guide, was great. We had our 5-year-old granddaughter along and felt she was perfectly safe. He was knowledgeable and so very friendly and accommodating. The pace was just right for us. Beautiful, calm float down the river. Tour gives you rubber boots and lifevest. I got engaged at the end of the tour at the river bank. The tour guide Becca took dozens of photos as it happened. great scenery great guide Becca. The tour was good but the cost did not justify it. Excellent. From the agent handling the order to the completion of the trip. This was our most favorite tour on our Alaska cruise. Was able to get my elderly mother on the raft along with my kids. All 9 of us took this slow gentle river ride, we saw 2 bald eagles on the tree where their nest was, another one was further up the river. This was as scenic as I imagined. A very worthwhile excursion. I highly recommend this one.